Sothink Video Encoder for Adobe Flash is not only a powerful and easy-to-use video flash converter.It can convert video to Flash (FLV) file of high quality in just a few seconds, but it also converts video to Flash (SWF) and generate HTML page - it can automatically create SWF player and HTML page to display the converted Flash Video for you. Sothink Video Encoder can convert home video to Flash video and share with family or friends in a much more faster and convenient way; using it you can upload flash video on blog or website to be seen by thousands. Why choose Sothink Video Encoder for Adobe Flash? · Provide different playback control styles (Full, Compact, Minimal) for different video dimension. And you can choose a color scheme you like for the playback control. 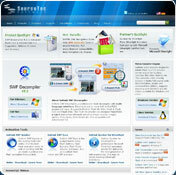 · The conversion speed is much faster, and the quality is much better than other software. · Support loading external subtitles. For example, you can create Flash video from the video file which uses vsFilter to load external subtitle. · Use it with Sothink DVD Ripper, then you can convert a whole movie DVD into a Flash video. What can you do with Sothink Video Encoder for Adobe Flash? · Convert home video to Flash video, and share with friends and family conveniently. · Publish the video in FLV format which can be played with no pause on different bandwidth network. · Convert your own video to Flash video, then you can broadcast it on vblog, podcast website, etc. with ease. · Convert important video (e.g. video conference file) to FLV for easy backup and playback. The FLV is widely supported. You can insert it into other files (".doc", ".html", etc. ), and play it on different computer system. · Using webcam record video and convert it to Flash video, then you can edit it as you want. For example, edit the Flash video as your web signature. · Convert various formats of video to Flash video with high speed. · Support almost all the prevalent formats of video. · Provide various pre-designed payback control skins for the SWF file. · The output Flash video can be saved as SWF or FLV file. · You can choose to get an embedded video within SWF files, or external video which is separate from the SWF file. · Users can set the frame rate and key frame interval for the conversion. · Set a URL for the browser to visit when the Flash video is clicked or the playback is finished. · Support customized HTML page for the output Flash video. You cannot download any crack or serial number for Sothink Video Encoder for Adobe Flash on this page. Every software that you are able to download on our site is legal. There is no crack, serial number, hack or activation key for Sothink Video Encoder for Adobe Flash present here. Our collection also doesn't contain any keygens, because keygen programs are being used in illegal ways which we do not support. All software that you can find here is freely downloadable and legal. Sothink Video Encoder for Adobe Flash installation package is prepared to be downloaded from our fast download servers. It is checked for possible viruses and is proven to be 100% clean and safe. Various leading antiviruses have been used to test Sothink Video Encoder for Adobe Flash, if it contains any viruses. No infections have been found and downloading Sothink Video Encoder for Adobe Flash is completelly problem free because of that reason. Our experts on malware detection tested Sothink Video Encoder for Adobe Flash with various spyware and malware detection programs, including fyxm.net custom malware and spyware detection, and absolutelly no malware or spyware was found in Sothink Video Encoder for Adobe Flash. All software that you can find on our servers, including Sothink Video Encoder for Adobe Flash, is either freeware, shareware or open-source, some of the software packages are demo, trial or patch versions and if possible (public domain licence), we also host official full versions of software. Because we want to be one of the fastest download sites on the web, we host all the software including Sothink Video Encoder for Adobe Flash on our servers. You cannot find here any torrents or download links that would lead you to dangerous sites. Rate Sothink Video Encoder for Adobe Flash 2.5 Build 81126!